Flash Fiction for for Aspiring Writers is a writing challenge, kindly hosted by Priceless Joy. The challenge asks us to write a piece of fiction from the photo prompt provided in around 100- 150 words – give or take 25 words. It encourages participants to comment, constructively, on other entries, so supporting each other’s writing. If you’d like to join in with this challenge, follow the link in the title of PJ’s, blog: Beautiful Words to see what to do. The challenge runs from Wednesday to Wednesday every week. As a girl I would dance at the edge of the pond, laughing at the ducks waddling along the grassy bank and sliding into the water. When I was grown and wed, I would scrub Tom’s tunics in that water till my hands were almost raw. But I couldn’t save Tom from the plague. I kept the farm going after he’d passed, and continued to sell my herbs. And the company of my cats kept me from being lonely. Then, in 1646, the Puritans came with their henchman. 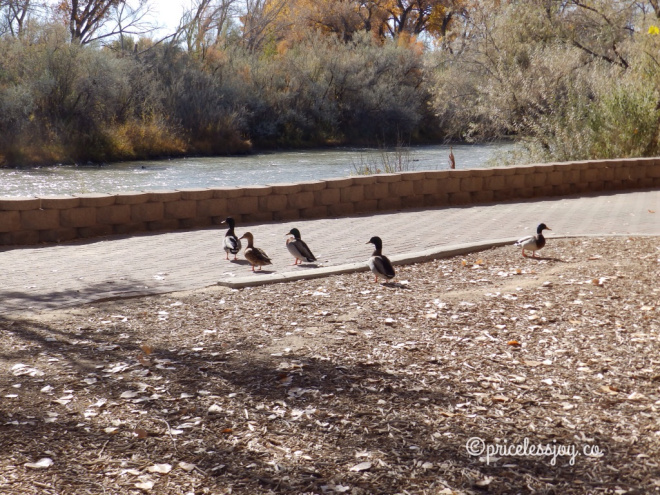 I come here sometimes to watch the ducks waddling along the banks. For anyone interested, here is a little piece I’ve put together (from various sources) by way of explanation about witchcraft and the use of the ducking stool. The main period of witch-hunts in Europe and North America was between 1450 and 1750, the last recorded execution of people convicted as witches being in the 18th century. For many years, magic had been part of everyday life, and was only considered wrong if it worked effectively – but for the wrong reasons. Witches were often called on to help church ministers with illnesses, or to help deliver a baby. If anything went wrong, people would question whether the witch had made a pact with the devil. Witches were handled cruelly, often being subjected to awful tortures in order to exact a confession and the names of others involved in their craft. Thumb screws and leg irons were common – the great pain of which usually resulted in confession. In 1645-6, a short period of ‘witch fever’ gripped England. Renowned witch finder, Matthew Hopkins, had 68 people from Bury St. Edmunds and 19 people from Chelmsford put to death in a single day. His main tool to discover witches was a ‘needle’, used to poke/prod a wart, mole or insect bite to see if the woman felt any pain. If she did not, she was a witch. It is believed that the needle was a 3 inch spike that retracted into a spring-loaded handle so that the witch felt nothing! The most likely women to be targeted as witches were widows, who managed to keep a household going alone. No woman was believed to be that strong – unless she had help from the devil. Those who offered/sold cures for illnesses and those who kept cats also came under suspicion. A cat (typically a black one) was said to be the witch’s ‘familiar’ or ‘familiar spirit’ – a supernatural being that helped and supported her evil work. 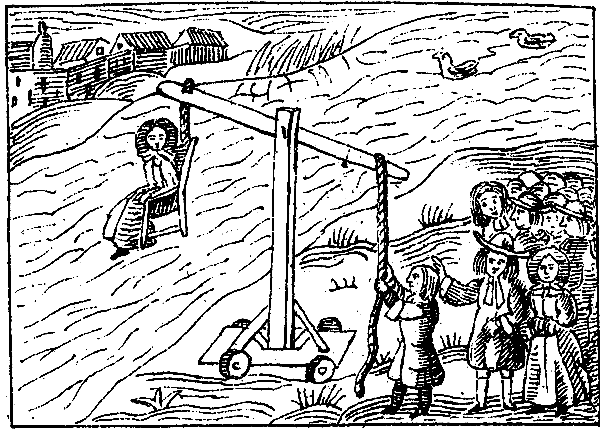 The ducking stool had long been a common punishment to inflict upon women, though some men were also subjected to it (e.g. dishonest tradesmen). It was generally used on prostitutes, scolds (women who nagged their husbands, or gossiped too much) and women accused of witchcraft. If the ‘witch’ survived the ducking, she was said to have been saved by the devil, so she was executed anyway – either hung or burnt at the stake. 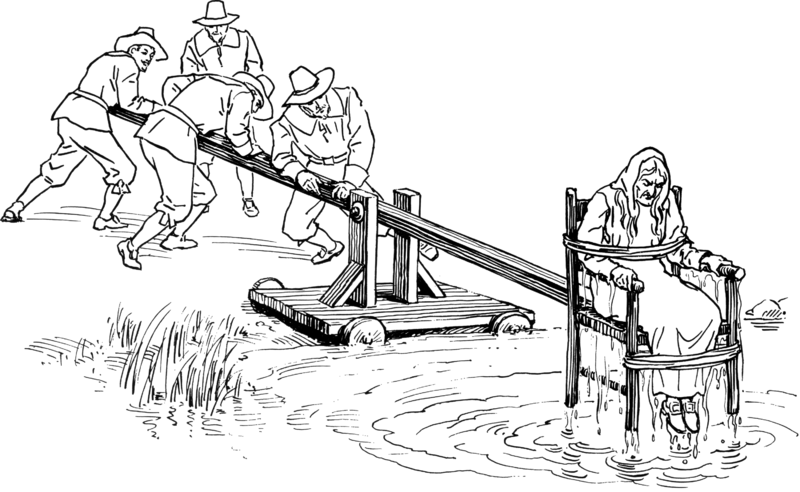 The ducking stool tended to be replaced simply by the ‘swimming test’ in many places. The woman was tossed into the water with her thumbs tied to opposite toes. If she floated she was a witch, therefore executed. If she sank and drowned she was innocent! Either way, she couldn’t win. Excellent story. It made me want to learn even more. I am shocked and saddened by the history of these “witch hunts.” How disgusting and sad! Seems to me just a way to get rid of women back then. I read somewhere that the witch hunts in America only came to a stop when the wife of the current President of the United States was said to be a witch. I guess it hit just a little too close to home. Need clarification re: current wife of the President of the United States is a witch? Source, please. I ask, with respect, because the current First Lady of the United States is not now, nor has she ever been involved in witchcraft. Insinuations and accusations to the contrary without proof seems to me to be merely a modern extension of the egregious accusations of witchcraft used against women as noted in Millie Thom’s wonderful, historical background presentation of the persecutions of 1450-1750. No, at the time of the witch hunts in early America – when all the women were being accused of being a witch and burned at the stake – it continued until the wife of the current (at THAT time) President (and I don’t remember which President it was) was accused of being a witch. When that happened, the witch hunt in early America came to a sudden end. I would NEVER accuse anyone and especially our first lady, of being a witch. Get your facts straight before you accuse anyone. My facts are straight, Priceless Joy. No problem. Appreciate the clarification. And, since we are clarifying, I made no accusation against you, merely asked for clarification which you have now given. You are most welcome, Priceless Joy. Apologies for any misunderstandings. Not intended. Thanks, PJ. So many things in the past leave us with a sense of outrage. The numbers of women who were accused and executed as witches is staggering. I believe in the years between 1450-1750 there were between 35, 000 and 100,000 executions. Oh my gosh Millie, that number is staggering. I had no idea there were that many executed. What a sad and tragic tale! Oh yes, I’m glad I’m born in a different century. I think if I was born then, my mother would probably be accused of witchcraft being a single mother and widower. Hope to read more 🙂 I love your writing a lot. A very sad end. To survive the plague and then that. Spooky last line! Wonderfully done (as usual), Millie. Not coincidentally, my Celtic book two deals with the plague and herbal usage by the Celts and Romans in efforts to stop its spread. The historical instances of abuse of women as in your example, whether religion is used as an excuse or not, is shameful. Love the historical context you provide with your posts. Herbs and herblore were an important part of life for centuries, and I can see how well you could fit it into your story. As for the historical instances of the abuse of women… Well, I’m sure we could both write an entire dissertation on that one. Well, I’m working as fast as I can considering all my on-going projects. Managed just over 3,000 words on the manuscript in the last two days. Yes, sadly we could likely write that dissertation covering the time from Day One to present, no doubt. I was thrilled with your comment, Jack – it wasn’t crass in the least. And I was only joking when I told you to hurry up with your writing. I’m a right one to talk about that at the moment! I’ll read your lovely book when it’s done. My impatience has had a good slapping down! I suppose I might be aggressive in writing when the need arises. Thanks for the lovely comment. Love it! I should write that chant on every wall in the house. Impatience and impetuosity are my biggest failings. I have dozens more, too, but I haven’t the space to write them all here. But, I tell myself, no one’s perfect! Such a tragic story. Horrific treatment for women who stood strong. Till date widows are not treated with respect in some of the developing countries and looked with suspicion and looked down upon as they have to work to meet the needs of their family. Whereas a widower gets to marry as he has difficulty in raising children and live his life. Interesting background on the tools to hunt and kill the witches. By and large they were burnt alive, I think. No escape from death. Yes, the treatment of widows today in developing countries is not good at all. Strong women are still viewed with suspicion and disrespect – as are widows who have to work to live, as you said. It will take a long time for such ideas to change and the status of women in those societies to improve. Great Millie.Your research and story is incredible. Thank you. I’ll have you know that the Town Crier of St. George, dressed in flamboyant 17th century finery, exhorted truculent termagants to repent imaginary sins in order to save themselves from being doused in the harbor, humiliatingly and thoroughly, for crimes including gossip and slatternly behavior, by means of a ducking stool (not to be confused with ‘duckling stool,’ a perch for ducks). This salubrious treatment was reserved for woman; elsewhere men enjoyed the invigorating afterglow of whipping posts and pillories. I liked your educational story about an unsavory practice. Now, Prospero, you are still keeping me guessing as to your location. I think the St. George you’re talking about is in Bermuda. Is that right? They hold ducking stool re -enactments there. It sounds like a very colourful occasion, what with whipping posts and all. The question now is… Is that where you are to be found – or is that a secret? If it is, I won’t ask again. Well-told and educational with an excellent last line. I can’t think to long about witch hunts, though, makes me too angry… All those poor women (and a few men, too). I agree with you there, Sonya. It makes me seethe when I think of all the trumped-up charges laid on those women – most of whom had only ever tried to help people, or make a living as a widow. There were a few men, too, but nothing like the number of women. Excellent story, Millie — poignant and thought-provoking. I learned so much from your historical explanations as well. Nicely done! Sadly tragically true ~ There were many strands to the abominable persecution of certain women who were accused of witchcraft, not the least was the religious angle. I think many women were accused because they were simple herbalists. Collecting and curing many ailments with herbs ~ Well written Millie! Thank you, John! 🙂 Many of Matthew Hopkin’s arrests and executions were in your area – East Anglia and Cambridgeshire. So I imagine you know a lot about all this. The ‘religious angle’, as far as I can see, was the biggest cause. The persecution of women by the Church is beyond belief! Thank you so much for reading. Well written sad tale..! I wish to have more to read… Good one! Excellent tale Millie and it reminded me of Geraldine Brooks’ novel – Years of Wonders which deals with the plague and the fate of the herbalists. and as you know suffered for it, I find such ignorance in those times very frustrating…..more so today….. I agree, it’s definitely worse today, when superstitions of the past can be so easily explained. But I realise, there are still certain cultures/groups of people who live cut off from modern thought and technology and cling to long-held beliefs. It will be a long time before things change with them. (Did you read Tribalmystic’s post a while ago about witchcraft on Papua New Guinea? That is definitely worth a read, and I think there’s a video to go with it. Scary stuff. Very interesting piece of writing. Thanks for the interesting extra information. Makes me think of African witch craft too. People can also be very cruel when they are found out. Thanks, Scrapydo. I almost added a paragraph about witchcraft today. There are still several areas of the world where they still persecute people (usually women!) as witches. Tribalmystic did a wonderful post about witchcraft in Papua New Guinea a while ago, and that was a real eye-opener. Torture still features in the traetment of ‘witches’ – all quite horrific. Parts of Africa are definitely mentioned as having witch hunts, particularly Cameroon, as well as Saudi Arabia. Very creative thinking of the ducking stool when you saw the picture of the ducks. Excellent story and it was great to read the historical information as well. Oh a historical piece. Love it! Wonderful piece of history woven into your story. Great voice. I enjoyed this. Oh I did not expect the turn this story was going to take! But it was a great piece as I had recently started to read about the witch hunts and was utterly baffled by it all. Ducking stool was new to me! This is a wonderful story, I never would have thought of that! Witch hunting is one of the historical events that’s always struck Me. I’ve read about it multiple times but it still leaves me with questions. I guess, there can be no right answer as to why such cruelty occurred. Thank you for the added information. Ah, another Monty Python fan! That last two sentences are so mysterious. Did her spirit return to the pond now and then or was she reincarnated? Great piece of historical fiction, Millie. Some people still frown upon those who use healing herbs. Times change, and they remain the same as well. I like the thought of spirits returning to places. It probably happens more often than we know. A reincarnation story sounds like a great way to expand this one.